Florence Nightingale remains an inspiration to nurses around the world for her pioneering work treating wounded British soldiers during the Crimean War; authorship of Notes on Nursing, the foundational text for nursing practice; establishing the world’s first nursing school; and advocacy for the hygienic treatment of patients and sanitary design of hospitals. In Notes on Nightingale, nursing historians and scholars offer their valuable reflections on Nightingale and analysis of her role in the profession a century after her death on 13 August 1910 and 150 years since the Nightingale School of Nursing (now the Florence Nightingale School of Nursing and Midwifery at King’s College, London) opened its doors to probationers at St Thomas’ Hospital. There is a great deal of controversy about Nightingale-opinions about her life and work range from blind worship to blanket denunciation. 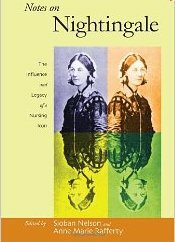 The question of Nightingale and her place in nursing history and in contemporary nursing discourse is a topic of continuing interest for nursing students, teachers, and professional associations. This book offers new scholarship on Nightingale’s work in the Crimea and the British colonies and her connection to the emerging science of statistics, as well as valuable reevaluations of her evolving legacy and the surrounding myths, symbolism, and misconceptions. I have not read your book, but I am wondering if you addressed the issue of Nightingale and fibromyalgia?